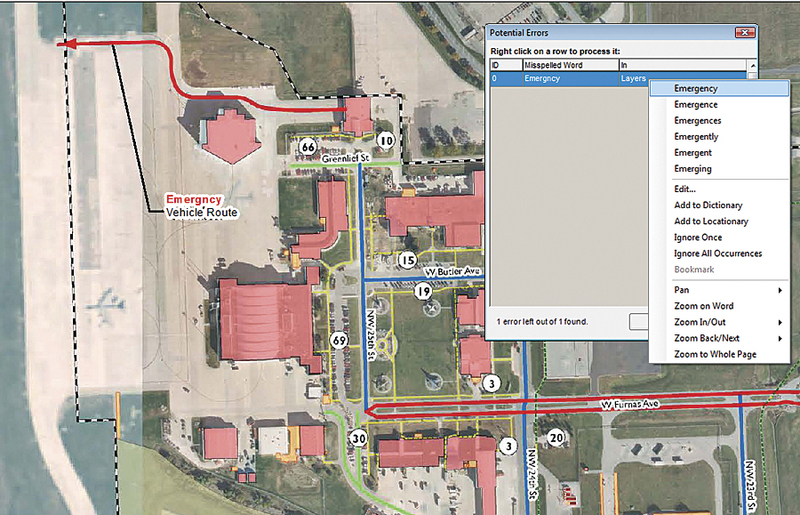 HDR uses Edgetech America’s extension for ArcGIS to spell-check GIS objects, dynamic text, and format/XML tags. MapSpeller corrects all text added in-house to HDR’s maps. Some forward-thinking companies clearly understand this. One such company is Esri’s Gold Tier Partner, Omaha-based HDR Inc. Founded in 1917, HDR is a top-ranked, award-winning architectural, engineering, and consulting firm that has realized projects in all the states and more than 60 countries. It serves diverse clients out of more than 185 locations with a staff of more than 8,000. Over the past quarter century, HDR has built a solid reputation for its GIS work, including defense projects serving the US Navy, Marine Corps, Army, Air Force, Coast Guard, and National Guard worldwide. 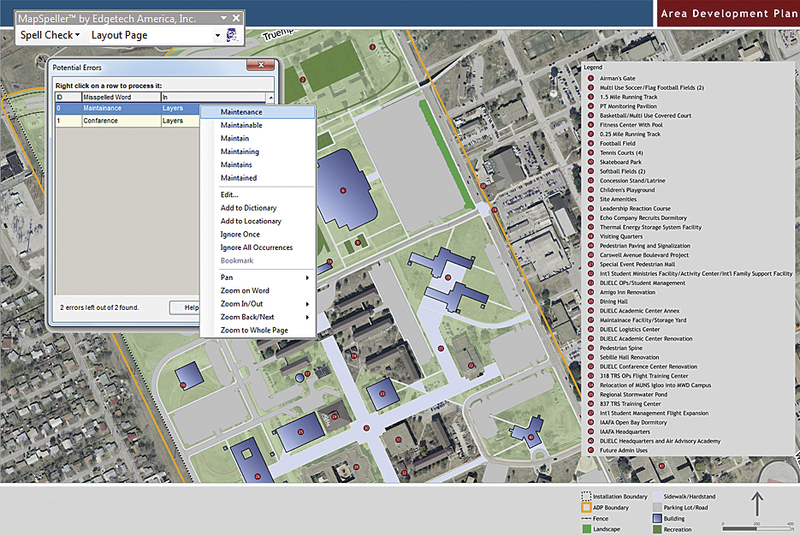 The creation of maps is an important and highly visible portion of HDR’s deliverables, whether in design, environmental restoration or planning, cadastral mapping, meeting the documentation provisions of the National Environmental Protection Act (NEPA), or managing cultural or environmental resources for these military clients. These were the driving forces behind HDR’s search for a spell-check program that works reliably in the ArcMap application of Esri’s ArcGIS. GIS managers at HDR sought a robust solution that would correct all text added in-house to maps, evolve with ArcGIS for Desktop and HDR’s own needs, and be fully supported by its developer. Alyssa Martin, GIS manager with HDR Engineering, began the process of evaluating spell-check solutions and chose MapSpeller from Esri Silver Tier Partner Edgetech America, Inc., of Glen Allen, Virginia. Automated proofreading and correcting should be part of any mapmaking process, according to Smiley. “After looking at a few maps manually, they all start looking the same, which dulls the user’s acuity for spotting typos.” Even when they are detected early, errors may be time-consuming to fix manually. For example, they may be several levels down (in the case of grouped graphics) or stored in tables (in the case of layer labels or geodatabase annotations). “Mapmaking can be tedious work,” says Martin, “and we don’t zoom in and look at every single thing we’re changing. In addition to just keystroking in text, we regularly have to translate from ‘GIS-speak’ to normal English. We’re creating aesthetically pleasing products and have to change the names all the time. The feature class name in a geodatabase might be something like STRUCTURE_EXISTING_AREA, but in the legend, you want to change it to Building or Facility.” Done by hand, this tedious process invites errors.